[Fix] Attendance- The Student Weekly Summary in the Attendance module now properly displays attendance information and includes indicators for dates in which school is not in session. [Fix] Attendance- When printing the Attendance widget as part of the Student Profile prebuilt report, the pie chart graphic properly updates for each student. [Enhancement] ISE Medicaid Michigan- The dates selected in the Verification Relationship will now be the only period of time that a User can see encounters for the delegate on the Verification Log Page. [Enhancement] ISE Skyward Extracts- The Skyward Extracts now INCLUDE students who do not qualify for an initial IEP. [Fix] ISE Medicaid Michigan- Up to four encounters billed on the same day for nursing services will be combined into one encounter with the correct number of units. For example, Nurse Sue enters four encounters on March 1, 2016 for nursing services at four different time periods in the day. When a batch is created, all four of these will be combined into one encounter with the units stating "4". [Fix] ISE Medicaid Michigan- The system will now randomly select the first/last name of ONE script when there are two or more active or active/current when you are creating a batch for submission. [Fix] ISE Michigan REED- The wording has been changed from "continues to have a disability" to "has a disability" in the first statement under "Determination Options (Required)". [Enhancement] Itembank- Many users like to use various attributes (e.g. 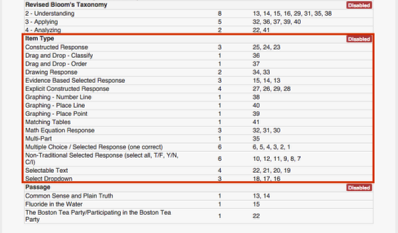 SBAC Target, Bloom’s Taxonomy, etc.) as Question Groups available for reporting in Illuminate. Now you can use “Item Type” as well. [Enhancement] Gradebook- Added overwrite warning for Aeries gradebook integration. This will warn users that existing data is about to be overwritten. Users can choose to continue. [Enhancement] CA SBAC Reports- The California Smarter Balanced Subgroup Summary Report can now be run for “All Tests” which allows you to group all tested grade levels together in the report. ISE [Fix} Referring provider name will no longer be combined on Submission Report for Medicaid Batches. Instead only one referring provider's name will be pulled through for the submission batch. [Fix] Behavior- Fixed an issue with the Behavior Search where records without participants would not appear in the search results. [Enhancement] ISI-Updated the Gains and Losses report to include weekend and not-in-session calendar days. [Fix] ISI-Fixed a bug in the Daily ADA report form which required a Reporting Period to be supplied. [Enhancement] ISE-Added Special Education Teacher/Provider as a required component on any NEW REED and now both the Special Education Teacher/Provider and MET Representative print out on the invitation. There is NO LONGER a need to add the MET Representative as another individual to the REED Knowledgeable Individuals Section in order for the role to print out on the invitation!